:Despite the popular theology of our day, Christians should not expect to get out of experiencing the tribulation or the end times. Nowhere in the Bible does the Lord promise us this, say Michael Brown and Craig Keener, two leading, acclaimed Bible scholars. In fact, they say, Jesus promises us tribulation in this world. Yet this is no reason to fear. In this fascinating, accessible, and personal book, Brown and Keener walk you through what the Bible really says about the rapture, the tribulation, and the end times. What they find will leave you full of hope. God's wrath is not poured out on His people, and He will shield us from it--as he shielded Israel in Egypt during the ten plagues. So instead of taking comfort in what God hasn't promised, take comfort in the words of Jesus: He has overcome the world, and we live in his victory. 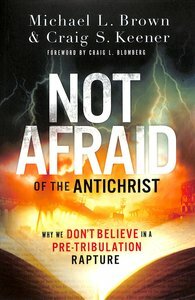 About "Not Afraid of the Antichrist: Why We Don't Believe in a Pre-Tribulation Rapture"